When you are craving all the flavors of a traditional muffuletta sandwich from New Orleans but you can’t get there just now, satisfy them with this Muffuletta Cheese Ball. Full of spicy Capicola ham, Genoa salami, provolone cheese, and olive salad, it will keep you and all your cravings happy! Have you ever been to New Orleans? You might recall the story of my first visit in my post about Muffuletta Deviled Eggs and how I ordered a ginormous sandwich thinking I could take it on. In case you haven’t gotten to read it yet, a Muffaletta is a delicious sandwich creation that was started by Italian immigrants in New Orleans. The name is also used to describe a round Sicilian sesame bread that the sandwich is built on. This New Orleans sandwich is full of meats, cheeses, and an amazing olive salad. The heart of the Muffeletta is the layers of salami, ham, mortadella, Swiss and provolone cheeses. All very good on their own, they make an amazing combo in the sandwich. Let’s discuss the meats a bit. I prefer the Genoa salami over a hard salami when making sandwiches because its made with pork instead of beef, it’s a little more moist, and has a tart flavor because of the wine used in making it. Genoa is usually studded with peppercorns which I love! I’m not usually a ham kind of girl so I choose a hot Capicola ham for more kick. If you love mortadella, feel free to use it too. It can be a little pricier and harder to find so just go with what you love! Just take me to the Muffaletta Cheeseball Recipe Already! If you’d rather skip my (very helpful, I think) tips and tricks, essential cooking info, and similar recipe ideas – and get straight to this delicious easy muffuletta cheese ball recipe – simply scroll to the bottom of the page where you can find the printable recipe card. 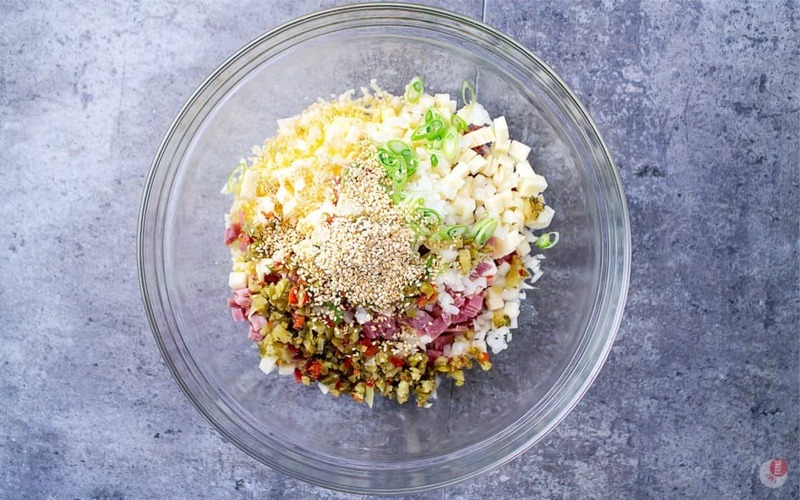 The star of the sandwich show is all the rich meats, but the muffuletta olive salad brings it all together! The homemade olive salad recipe, which Central Grocery is famous for, is full of black and green olives, celery, cauliflower, carrots, sweet peppers, various spices and olive oil. This historic new Orleans landmark sells it by the jar along with all the other ingredients to make the traditional Muffuletta. Sandwiches are a great appetizer to serve at parties, but depending on the ingredients, might not do well to assemble and then sit out for long periods of time. 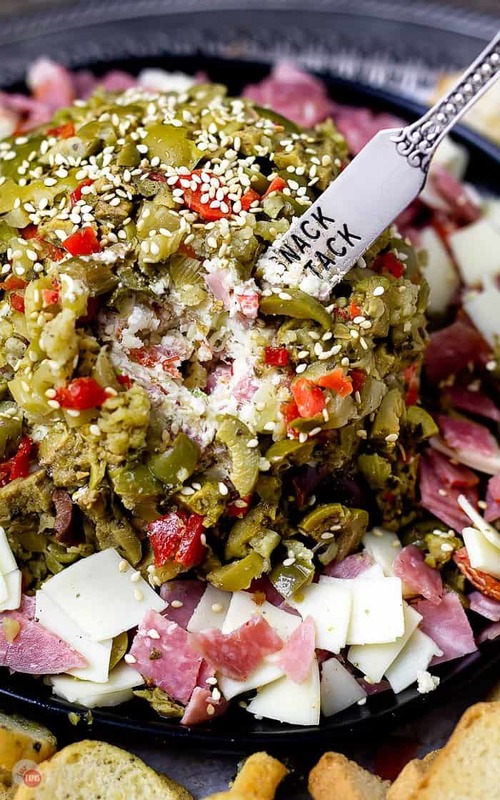 The olive salad in the muffuletta makes a great case for this. I don’t know about you, but I do not like soggy bread unless it is soggy because I am sopping up some sauce. The best way to preserve the flavors of the famous Muffletta sandwich without risking soggy bread is to make a cheese ball! 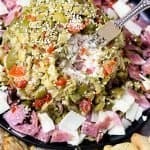 My muffuletta cheese ball is all the best parts of the sandwich but in an easier to make and serve dish. For this specific cheeseball recipe I opted to use Genoa salami, spicy Capicola ham, and provolone cheese. Mixing all the meats and cheeses, along with a little of the olive salad and spices, gets you a delicious cheese ball that you can store for a few days making it easier to get ready for the party. 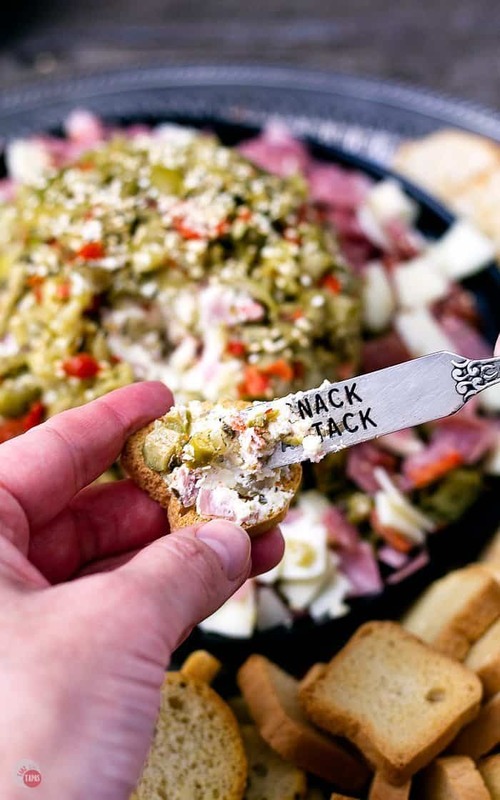 Just pull the muffuletta cheese ball out when you are ready to party and dress it up with even more of the tangy olive salad, some extra meat and cheese, and surround it with sturdy crackers and crostini! A: You can mix the cheeseball together but I would hold off on coating with the olive salad until ready to serve. Q: What if I can’t find Capicola? A: Feel free to use a spicy salami, spicy ham, or pepperoni in a pinch! Q: If I don’t have “olive salad” can I just use chopped green olives? Q: What is the best cracker to serve the muffaletta cheeseball with? A: Something strong and sturdy is best. I found great results with some “melba” toasts, crostini, and thick club crackers. 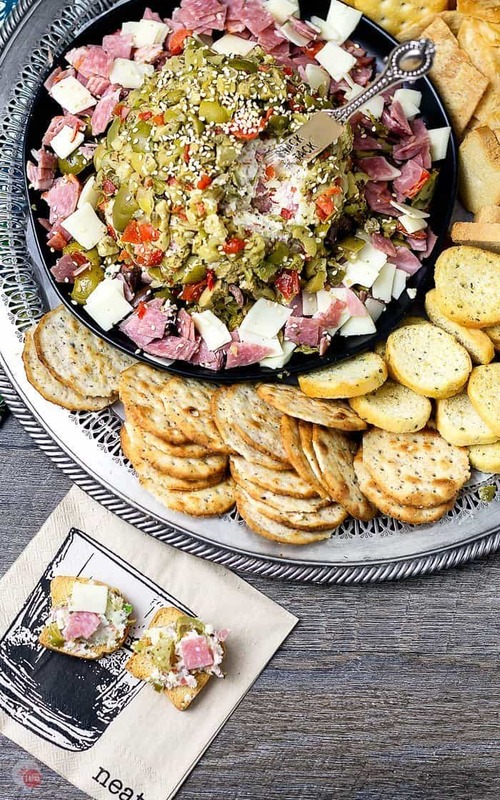 Whether you are in New Orleans or not, or even if it isn’t even Mardi Gras time, celebrate your own Fat Tuesday with this Muffuletta Cheese Ball that is sure to be a hit at any occasion! Looking for a Mardi Gras recipe to take to a party you’ve been invited to? Check out all these Mardi Gras Ideas, both sweet and savory, to fit your special occasion! 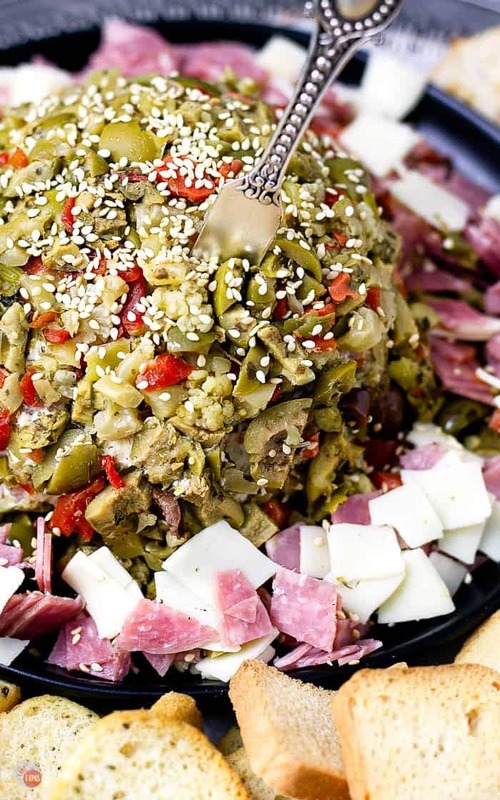 If you love this Muffuletta Cheese Ball Recipe as much as I do, please write a five-star review in the comment section below (or on Pinterest with the “tried it” button – you can now add pictures into reviews, too! ), and be sure to help me share on facebook! 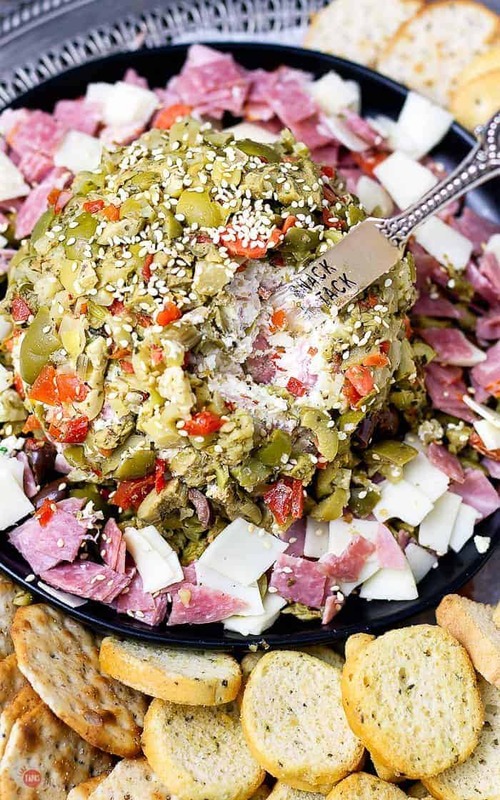 Full of spicy Capicola, salami, provolone cheese, and olive salad, this muffuletta cheese ball will keep you and all your guests happy during Mardi Gras! In a mixing bowl, combine the cream cheese, mozzarella, Capicola, salami, provolone, green onions, spices, 1/4 cup olive salad, and sesame seeds. Chill for 30 minutes or up to 3 days. Roll in or use your hands to coat the outside of the cheese ball with olive salad. Place on serving platter and sprinkle with extra sesame seeds for garnish and surround with any extra chopped meats, cheeses, and sturdy crackers! * 6 slices is appx the same as 2 ounces or 1/8 pound or 1/2 cup chopped. This is a great twist on a cheese ball! The flavors sound so delicious. I love that cheeseball! It’s truly unique and I’d love it for lunch or an appetizer! 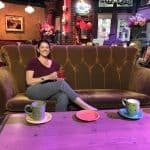 I worked at a French cafe and they served a muffuletta. It was always so popular. I love the twist of making it into a cheese ball! Very creative.